Itâ€™s 1834 and William Horner has just invented the zoetrope. Its rotating drum transforms still images into a single moving picture. As the Greek name suggests, itâ€™s the â€˜wheel of lifeâ€™ (zoe â€˜lifeâ€™, trope â€˜turnâ€™). Fast forward to today and Sonyâ€™s Motionflow technology, intelligently adding new frames to action scenes to make them appear smoother than ever. At 200 frames a second, Motionflow 200Hz is like a fast, fluid 21st-century zoetrope. 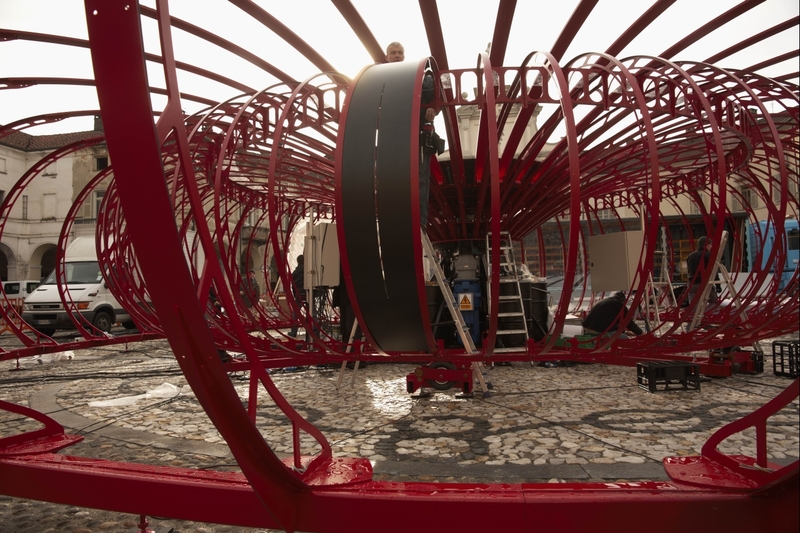 What better way to celebrate this technology than through the creation of BRAVIA-drome, the most technologically advanced zoetrope in the world. Weâ€™ll bring you breaking news of our Motionflow 200Hz event, as it happens. Stay tuned. Footballâ€™s speeding up: the players run faster, the ball travels further. Itâ€™s the ultimate test of Motionflow 200Hz, the worldâ€™s first technology which makes intense action scenes appear as clear and smooth as real life. Itâ€™s certainly a challenge, keeping up with AC Milan player Ricardo Izecson dos Santos Leite, better known as KakÃ¡. Heâ€™s one of the fastest players on the pitch with a speed thatâ€™s rarely matched, making him the perfect embodiment of sharp and fast Motionflow 200Hz technology. Currently, they are still building the whole construction. You can follow their progress on the blog specifically setup for this. There seems to be a concurrent trend. Two companies just announced new projects / plattforms on which they want to listen to consumers, engage them, discuss product development with them. You know better than anyone else what you want from Starbucks. So tell us. Whatâ€™s your Starbucks Idea? Revolutionary or simpleâ€”we want to hear it. Share your ideas, tell us what you think of other peopleâ€™s ideas and join the discussion. Weâ€™re here, and weâ€™re ready to make ideas happen. Letâ€™s get started. As you would expect, you can post ideas, vote on other’s ideas, discuss ideas, etc. In addition, there is a blog called „ideas in action“ that covers the project. At the moment, some sources are rather cynical about the project, because people mostly just ask about free drinks, fre Wi-Fi, etc. I am curious to see if there will be some really good ideas with added value resulting from this approach. However, we’re a little unsure if the tactic will provide Chrysler with what it needs to shape the future of its products and services, considering that the only people likely to sign up are partisan pistonheads who are already married to the Mopar camp or slighted customers looking for a place to vent. This sort of online listening post worked for Dell, whose IdeaStorm website resulted in a few concrete product developments and, in turn, helped to turn some of the computer-maker’s fiercest critics. One of them, Jeff Jarvis, went from a state of high dudgeon on his blog to praise the company in BusinessWeek. In my opinion these approaches should probably work fine, as long as there is added value for both sides. If the consumer ideas and suggestions are crap, useless, unreal or simply silly, the companies might soon stop asking consumers in this fashion. It would then be much easier to go back to the old fashioned model of focus group research, where the noise to signal ratio is much better. On the other hand, there should be some real improvements/products/ideas coming out of these approaches, making the whole outcome visible to the participating audience, showing them that their little contribution did infact change the way these companies go to market (even if the resulting outcomes were not your own idea, you would appreciate the effort made by the company). Otherwise we’ll start having similar symptons as you have in German elections nowadays. You feel like your vote is too small to make a difference – and heck, no matter what people vote for, it doesn’t feel like things change much anyway. So why bother.